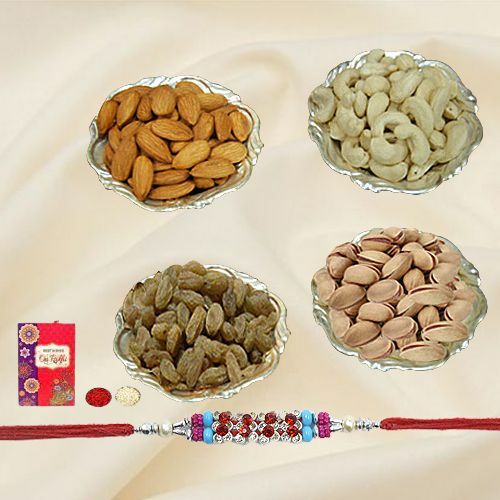 Deck the beautiful relation you share with your siblings and dear ones by sending them this Designer Free Rakhi with Assorted Dry Fruits on Raksha Bandhan, that comes with a free Rakhi, Roli Tilak and Chawal. Make a sweetest relationship with your dear brother with this grand Hamper consists of mixed Dry Fruits like Apricots, Raisin, Cashew, Almond of 500 gm. in 4 Silver plated Bowls. Mixed Dry Fruits 200 gms (Gross Weight) with Silver Plated 2 Bowls (Cashew and Raisin)along with Free Rakhi, Roli Tika and Chawal. Mixed Dry Fruits 500 gms (Gross Weight) with Silver Plated 4 Bowls (Apricots, Raisin, Cashew, Almond)along with Free Rakhi, Roli Tika and Chawal.